I have been absent for a little while, and before fall passes us by I'm popping back in today to share some simple, fun PUMPKIN ideas. 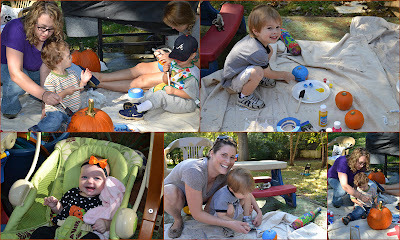 Last week, Reed and I got some pals together for a low-key pumpkin party at Lauren's house. We played outside, ate lunch together, and painted pumpkins with our tots. Lauren prepared a super cute and festive table for lunch. :) (I snapped this picture early on, so as you can see not everything was ready to roll). 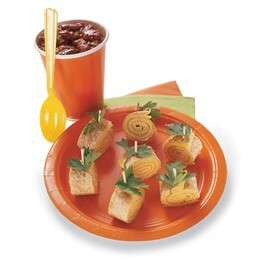 Pumpkin Pinwheels- These look so cute, and would be toddler-friendly with just turkey and cheese. 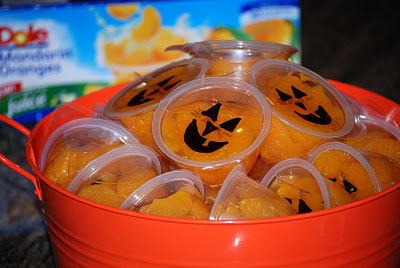 Jack-o-Lantern Fruit Cups- Quick, easy, and fun. We used these for our lunch. Pumpkin Eggs- I haven't made these deviled eggs, but thought they were so creative. 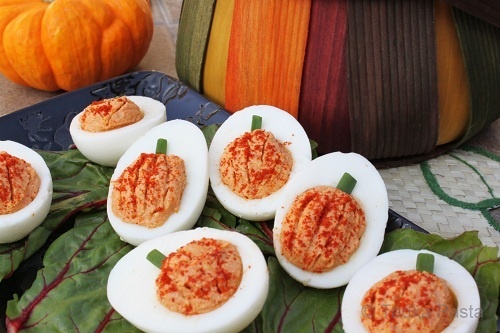 It looks like the linked recipe is all fancy, but really just the shaping, paprika, and chive stem would pumpkin-ize your normal recipe. 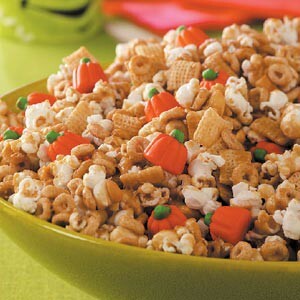 Pumpkin-y Snack Mix- Candy pumpkins (and/or candy corn) add a festive touch to your favorite sweet snack mix recipe! 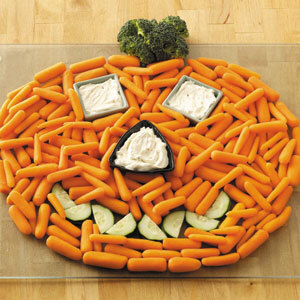 Veggie Tray- Quick and Cute. 2- This year we had Lauren's exacto knives (as opposed to just using the strips of tape to make a design). I still just taped off an "M" because Reed was ready to get his paint on, but Lauren covered Max's pumpkin in painter's tape and busted out a baseball pattern! Fun.